Navigating the exercise world after giving birth can be difficult. Your ideals of what you thought you would do (or be able to do) before you had your baby, might be completely different to now, when you actually have your babe in your arms. One of the first things you may notice is that your belly may not lo ok that different from when you were pregnant, except squishier! You have to remember that it took you 9 months for your body to change shape and a good rule of thumb is to allow 9 months to get your body back into shape. To safely exercise in the first 3 months after your birth, it is wise to pretend that you are still pregnant. In terms of hormones, you are, kind of. Your body will still have the hormone relaxin floating around, which loosens your joints and ligaments. This means you still have to take extra care not to over stretch, especially through the pelvis. Your pelvic floor might be feeling particularly weak and some other issues to be aware of are carpal tunnel. Breastfeeding may be taxing on your upper back and sleep deprivation may make the whole situation seem a lot harder than you imagined. The best exercises during the first few months are similiar to what you could manage during the last months of pregnancy. 1. Focus on your pelvic floor. A great time is while you are breast-feeding as lactation will be working on pulling the uterus back into shape. But whether you are breast feeding or bottle feeding, it is a time when you are sitting still and this allows you to concentrate on first activating the pelvic floor and then gently drawing in the lower abdominal. 2. Focus on your posture! Use pillows to bring baby closer to your breast or bottle, rather than folding over baby causing the upper back to be stretched and the muscles in the chest to contract. Regularly draw attention to your posture, while you are sitting, standing and walking. If you are putting baby on your hip, try to swap hips. 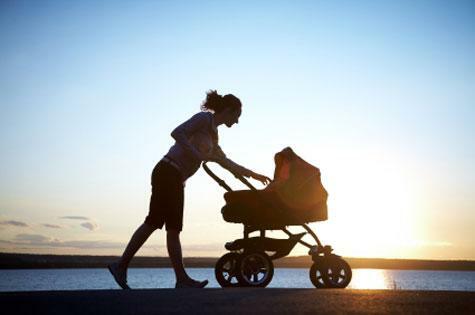 If you are pushing the pram, walk tall (adjust your pram so you can do so easily) and think about lifting your breasts up off your chest with your posture and connecting with the muscles in your upper back. 3. Getting out and about with the pram. Walking is a great way t o get your body back into shape and can also have a fantastic effect on your mood. There are often lots of appointments in the early days with baby. Try and schedule the time, so that you can walk there and back. When walking, try to focus on pelvic floor and holding your posture upright. Walking tall allows more oxygen into your diaphragm. This means you will not only look better, but feel better! 4. Rest! A very important part of any exercise routine is rest. Adequate rest allows the muscles to heal. If you are offered help with baby – take it! Assess what is really important … the load of washing or a nap. If your body is repaired you will be able to achieve a lot more in the long run. 5. Join a specialised post-natal exercise class. Your body’s needs in regards to exercise have changed after having your baby. Often this is not quite understood by fitness professionals. Finding a fitness professional who reminds you to contract your pelvic floor at the right time during an exercise is very important. Exercising post-natally without due care can be the straw that breaks the camel’s back that takes you to prolapse. Don’t be afraid to ask your personal trainer / fitness instructor about their understanding of pelvic floor issues for post-natal women. 6. Check yourself out with a women’s health physiotherapist. We don’t think twice about putting our car in for a service and god knows what they do… yet we quibble over spending money on ourselves! If you are really unsure of whether you are contracting your pelvic floor correctly, find a women’s health physio that offers real time ultra sound. They will be able to show you how to correctly contract your pelvic floor on screen. This is usually a big “ah ha!” moment! 7. Avoid crunches and sit-ups! These are not the way to a flat belly and make sure that you don’t have diastasis before resuming them. If you are not sure if you have the splitting of the abdominal muscles, ask your mid-wife, fitness professional or women’s health physio to show you how to check. The best exercises for obtaining a flat belly are pelvic floor exercises, which will contract the transverse abdominis … who would have thought!